As you can see, they are advertising their brand new “Ebi-Mayo” pizza. Prawns and mayonnaise, to you and me. If you want my opinion, it looks suspiciously like somebody has been sick on a pizza base. What’s with all the corn? Pizza in Japan almost always features corn, which I personally reckon has no place on the top of a pizza. At least this one appears to have at least a tiny amount of tomato in it. You know, they actually have “mayo pizzas” here, in which the tomato has been substituted with mayonnaise. Sometimes they don’t even have cheese on. It’s not really pizza, and it tastes pretty nasty, too. 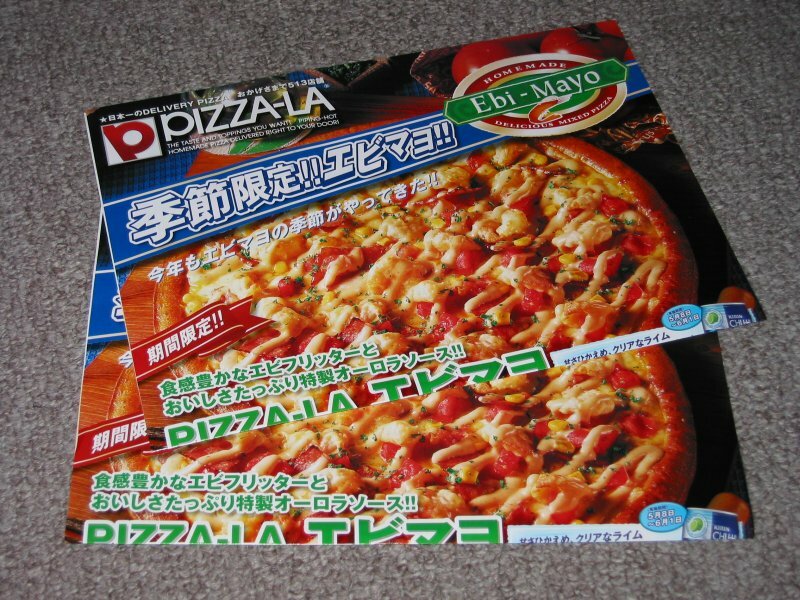 The price of the “Ebi-Mayo” pizza, by the way: JPY 2,300 for medium or JPY 3,400 for large. Find out how much that costs in your own currency here. Perversely enough, I’m actually feeling hungry now. Not hungry enough to eat an “Ebi-Mayo” pizza, though, so I’m going to cook some decent food.